So, I just finished this book the day before yesterday. It’s still quite fresh in my mind, unlike quite a few of my earlier reviews. I’m happy that I’m now halfway through the series but at the same time I’m taking a break and not reading the next two yet. Why am I taking a break? Well, I feel that this series doesn’t have the same fun and excitement as the previous series. It took me (and there is a reason for this) three weeks (I think) to read this book. The reason is not that it was bad, but that I’m dedicating more time to writing rather than reading. I guess this book kind of ends on a cliffhanger. I can’t reveal anything there without spoiling the story, so I’ll write a brief and general review. This book follows all the heroes from the last two books. So, we finally get Percy and Annabeth back together. We also see the two camps collide and create one happy family (sort of). Seven are chosen (well pre-chosen) for the new quest in this book. The heroes will eventually find themselves in the real Rome to complete their quests (there are a few this time, rather than one). I felt like this book had pace, but the characters didn’t have the same feel. As I have said in previous reviews, but maybe I’m looking back through rose-tinted glasses, Percy is not as fun as he used to be. I did like that Annabeth got quite a main quest, but I didn’t like the fact that she’s portrayed as powerless apart from her intellect. 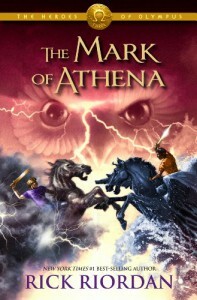 There are some known gods and some unknown gods that appear in this book and, of course, heroes that have become gods. I thought one of the sacrifices made by the team was pretty funny and in league with the earlier books. That’s probably my favourite scene (you’ll know it when you read up to it). I guess like my previous reviews of this series; you can loan this from your library. I still enjoy the series, but not as much as the last series. I really do like Rick Riordan’s writing, it just feels like it’s not as snappy (maybe also a product of the longer books). I’m still looking forward to completing this series.